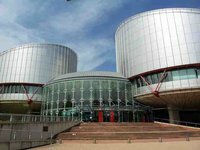 The European Court for Human Rights (ECHR) has cancelled the planned February 27 public hearing on Ukraine's suit against Russia involving Crimea and has decided to postpone it, the Kyiv-based Ukrainskaya Pravda ezine has said, citing the court’s press service. The reasons for such a decision were not clarified by the ECHR, which only announced the cancellation. The ezine said parties to the dispute have already received an official message on the cancelled hearing. As earlier reported, on February 4, Ukraine's Justice Ministry announced the start of hearings on the first of five lawsuits filed earlier in the ECHR against the Russian Federation. The first of the cases was scheduled to be heard on February 27, 2019. Ukraine's Justice Minister said the first cases of violations of human rights by the Russia were filed with the ECHR in 2014. During 2018, two new claims were filed - on violation of the rights of political prisoners and on the illegal seizure of Ukrainian sailors.